Bad weather is causing havoc again, with many parts of the country experiencing heavy rains, floods, landslides and strong winds. 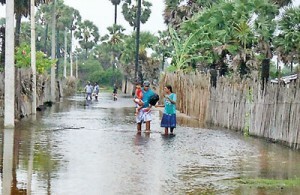 The North Central, Eastern, Uva and Central provinces are currently experiencing heavy rains while floods are reported in the Anuradhapura, Trincomalee, Polonnaruwa, Mannar and Puttalam Districts. Over 5,000 persons are at present reported displaced due the floods triggered by continuous heavy rains. 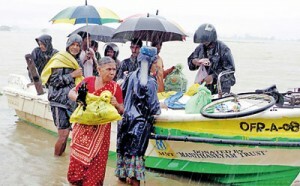 Floods in Mannar have resulted in 35 houses being damaged and over 400 people having to live in shelters. 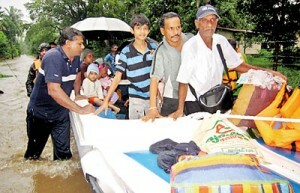 50 families in Kinniya in Trincomalee District are affected by floods. Strong winds and heavy rains are prevailing in Kandy District and in certain parts of Nuwara Eliya District. According to the Disaster Management Centre (DMC) Patha Hewaheta, Minipe, Yatinuwara, Kundasale, Ududumbara and Medadumbara in Kandy are experiencing heavy rains and strong winds. possible landslides and cut slope failures if rain continues.In Matale district, all divisional secretariat (DS) areas especially the Laggala-Pallegama and Rattota Divisional Secretariat areas are at high risk, the NBRO said. 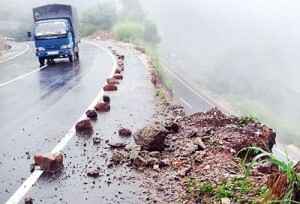 In Kandy, all divisional secretariat areas are at risk of landslides, with the Kandy-Badulla road via Randenigala being more prone. The same warning applies to Badulla DS as well. In Nuwara Eliya District, the Walapane, Hanguranketa and Nuwara Eliya divisional secretariat areas have been warned. The NBRO warned residents and motorists to be watchful as mountainous areas, man-made cut slopes and roads within the districts may be at a risk of landslides if the heavy rains continue today (21). Polonnaruwa also received heavy rain. The Meteorology Department warned of heavy fog in Badulla District. Meteorology Department Duty Forecaster Jeewan Karunaratne said as a result of disturbances in the upper atmosphere rain will be experienced in the whole country, with heavier falls in the Northern and Eastern areas. 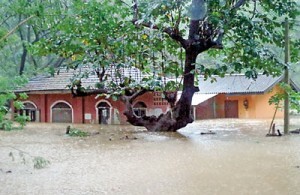 “These kinds of disturbances activate monsoons and this time it is the north-east monsoon,” he said. He said heavy rainfall of over 100 mm will be reported in these areas and strong winds up to 80 km per hour may occur during rains. Lightning and strong winds may cause damage to lives and property, the Department warned. He added that cold weather can be experienced in the mornings as the skies are cloudy during evenings and at night. The Railway Control Room said railway services on the Northern Line have been temporarily stopped due to heavy rain in the northern areas with the railway lines at Thambuttegama and Talawa being under water. Train services between Colombo and Trincomalee are also running only up to Gal-Oya junction. Even road transport services between Colombo and Batticaloa have been disrupted due to flooding in Manampitiya and Gallella. Irrigation Department’s Director (Water Management) Janaki Meegastenna told the Sunday Times that over 40 major tanks have reached spill level and that 80 percent of the tanks have been filled to near capacity. 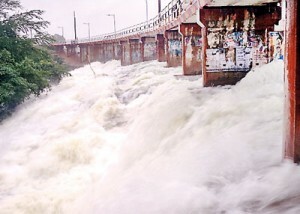 “Twenty sluice gates of the Rajanganaya tank have been opened. Similarly, sluice gates of many tanks in Anuradhapura, Kurunegala, Trincomalee, Polonnaruwa and Hambantota Districts have been opened,” she said. All tanks in the Ampara District are at spill level, except the Senanayake Samudraya, she said. Police OIC to be charged for act of cowardice? Cabinet approves 2-storeyed building at over Rs 90m for Bhikku Uni. SL’s UCC envoy appointed its Sec. Gen.